The Rescue Team will be posting details about transports and treatments at the Animal Care Center in the days and weeks ahead. In the meantime, we'll be sharing pictures and video of the activity at the sea turtle hospital so you can have a feel for the action during this incredibly busy year—more than 150 turtle patients and counting! 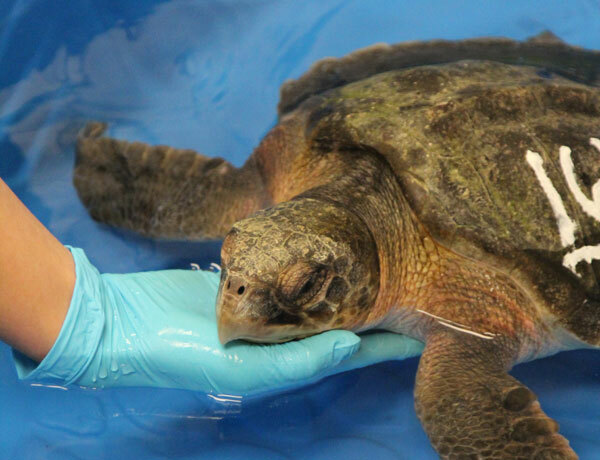 Spend some time with the turtle patients at the Aquarium's Animal Care Center in Quincy, MA. This video featured the three species of sea turtle we've seen at the turtle hospital this year, and most years: the little Kemp's ridleys, a big loggerhead and an active green sea turtle. Can you tell the difference? Check out this webcast where we talked about the differences in some of the sea turtle species. 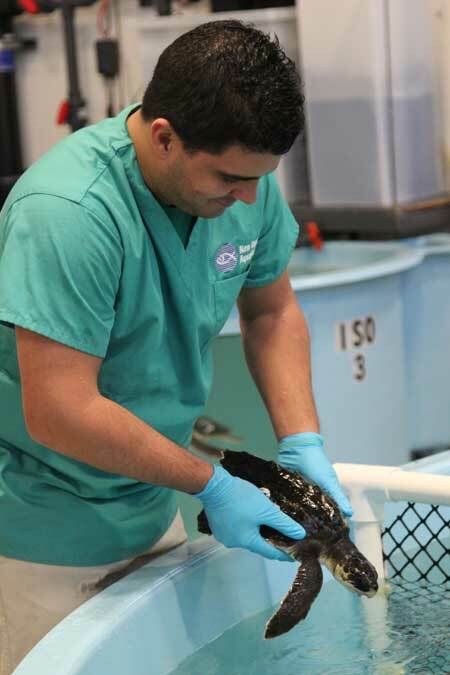 We also had a hybrid sea turtle among our patients this year. Check out this post to see how we can determine whether a turtle is a hybrid. Many thanks to the people and institutions helping out during this extremely busy stretch—from our partners at Mass Audubon at Wellfleet Bay searching for stranded turtles to our all our rescue partners to generous donors helping to shuttle turtles all over the country to the dozens of volunteers closer to home feeding turtles and doing laundry. Read some of the local media coverage of this year's record sea turtle stranding season. By the end of today, we will have had over 200 turtles come through our door. This is an incredible number, but even with the multitude of intake exams, feedings, and treatments, there are always those patients that stand out. Even though all the turtles are amazing and special, the more critical cases tend to leave an impact on me. Those are the ones that you stay up at night worrying about, spending the extra hours doing special treatments on, and much, much more. 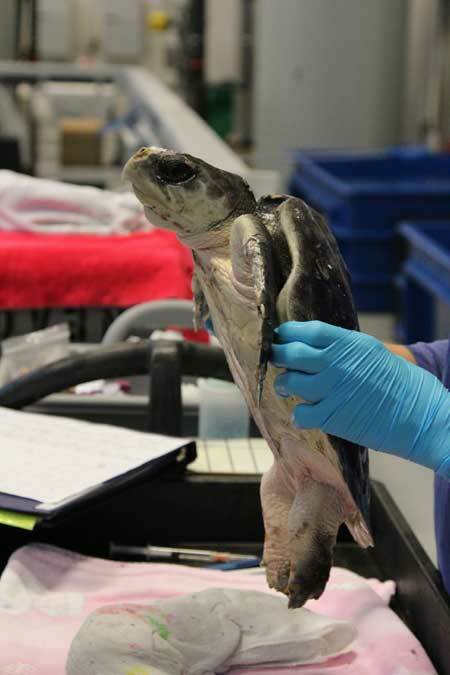 One such case is #25, a Kemp's ridley sea turtle who fought his way back to life. As you can tell by the low number, #25 was one of the earlier turtles of the season (we are now up to number 216). During his intake exam, he was extremely lethargic and barely breathing on his own. After emergency drugs, signs of life were more apparent, but by morning he had declined even more. I remember finding our head veterinarian, Dr. Innis, already placing the turtle on a ventilator in the early hours of that Friday morning. After several doses of emergency medications, fluid therapy based on blood work, ventilation, intense treatment, and stimulating kiddie pool swims, #25 made a comeback. Due to some obvious signs of pneumonia that we saw from various diagnostics and clinical status, we immediately changed the course of treatment from our normal routine. Besides changing the antibiotics to target this infection, we also started nebulizer treatments. This form of treatment vaporizes the medications (we use an antibiotic as well as an anti-fungal) so that they will have direct contact with the patient's lungs as he inhales. The better contact time to the actual infected tissue was our hope in order to provide this turtle with a better prognosis. The above photo shows the setup we use for nebulization. Normally, we place the turtle on towels in the box during nebulization, but we did things a little different this time around. #25 was extremely buoyant in the water (he was still getting shore supervised kiddie pool swims at that time), but he would breath much better. We decided to add a little bit of water for him to swim in while inside the box (photo above). As you can imagine, turtles can hold their breath for a fairly long time. Since this setting stimulated his breathing, it then allowed for more medication to be inhaled and penetrate the infection. In the above photo you can see the fumes of the medications that #25 was inhaling while in the box. It took some time, but we were eventually comfortable leaving #25 in the big pool overnight. Over the course of a few weeks, his buoyancy resolved so that he could then dive to (and rest on) the bottom of the tank. He also became much stronger and started to eat. He started receiving some of his medications orally, allowing us to stop the nebulization. Currently, #25 has improved dramatically and we are extremely pleased he turned the corner from being on a ventilator to being one of our best eaters. He still has pneumonia and long road ahead of him, but we are proud to say #25 is alive. But don't worry... we have plenty more critical patients to tell you about! I took the next couple photos last night to share with you what the Animal Care Center in Quincy looks like right now. The turtle hospital is full of patients, including more pneumonia cases, fractured femurs, severe carapace wounds, and eye injuries galore. We even had to add emergency tanks to our setup to hold all these turtles. 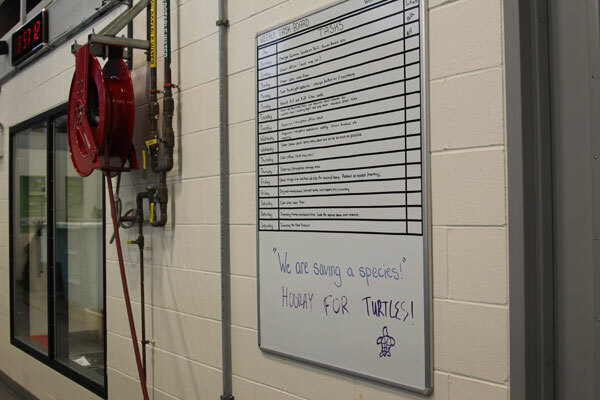 A special thanks to other departments in the aquarium for lending us equipment and helping to construct many of these. And a whole tank just devoted to loggerheads! This means more pneumonia, more eye injuries, even some missing flippers, but on a larger scale. We are still getting these larger turtles and 7 more are coming through the door right now. I hope to share some more special cases with you eventually, but the new patients await. The Rescue Team will be posting details about the transports and treatments at the Animal Care Center in the days and weeks ahead. In the meantime, we'll be sharing pictures and video of the activity at the sea turtle hospital so you can have a feel for the action during this incredibly busy year—more than 150 live turtles treated so far, and still counting! With more than 150 rescued sea turtles passing through the Animal Care Center, our facility in Quincy is bursting at the seams. Fortunately, we have a great network of partners up and down the East Coast who can help us rehabilitate all these patients. But before any animal is shipped out to its rehabilitation home, it needs one final bout of TLC from our team. A Rescue volunteer gently removes a Kemp's ridley sea turtle from its pool in preparation for transport. 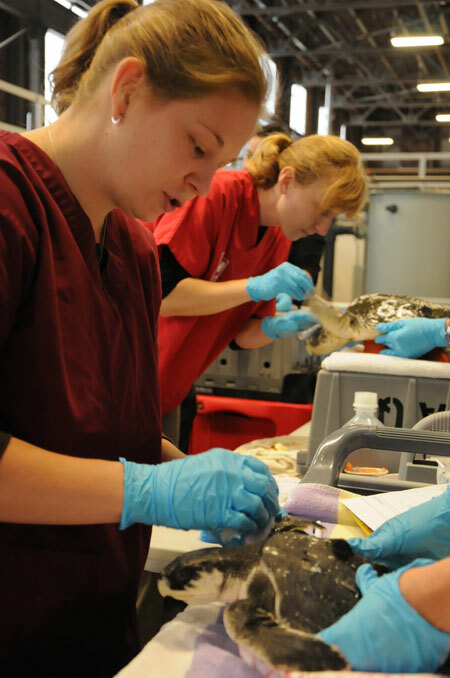 One last turtle exam before the turtles ship out: A rescue staff and veterinary staff make sure each turtle is healthy enough to travel and administer any medicines or fluids required prior to transport. All information about a turtle's exams are logged in a medical record that follows the turtle to its ultimate rehab facility. 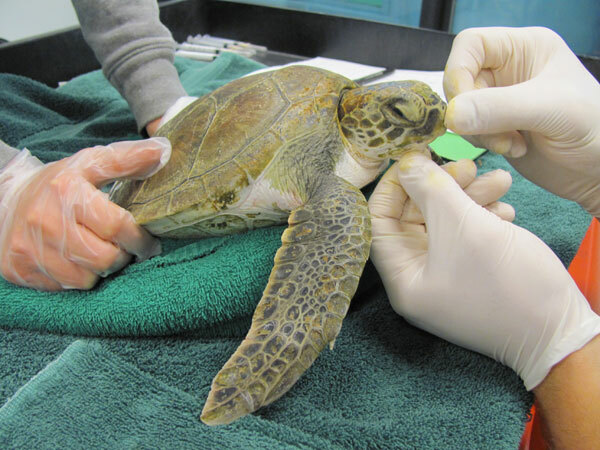 Each turtle has a specialized medical plan tailored to that particular animal's needs. 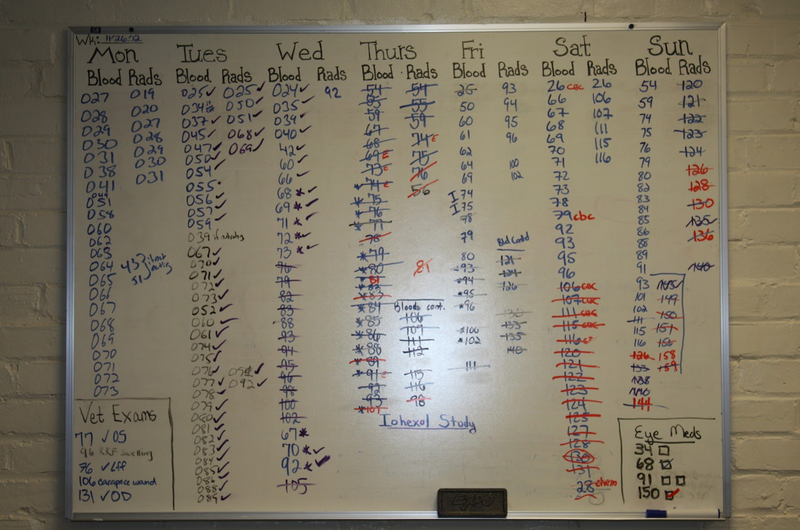 The photo above shows the blood sampling and radiograph (X-Ray) schedule for one week. 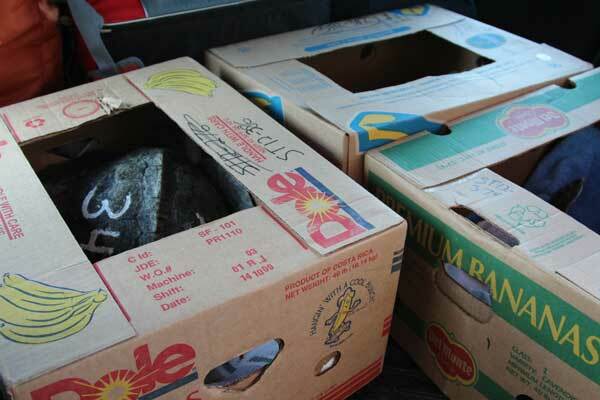 During large events like this one, turtles are often transported in banana boxes. It's helpful because the boxes come free from local grocery stores, they are roomy enough for the smaller patients that usually strand in large numbers. 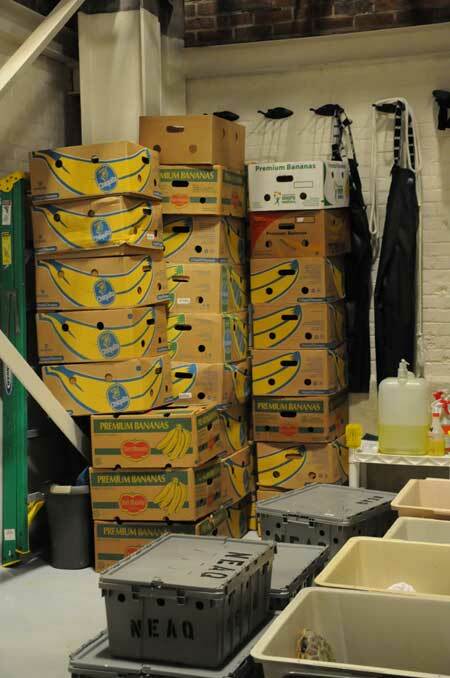 We weren't kidding about those banana boxes! These of course do not have turtles in them in this photo. At the bottom of the photo you can see our standard gray sea turtle transport boxes. We are nearly out of those at this point! As is the case with this small group of turtles that went to the National Aquarium in Baltimore, once stable, many turtles from the Aquarium's Animal Care Center are driven or flown to rehabilitation facilities up and down the East Coast. This is a media release cross posted on the Aquarium's News Blog. Learn how you can support the Aquarium and its efforts to rehabilitate and protect endangered marine animals. It's been quite a year, the 164 sea turtles rescued alive this year smashes the old record of 127 set in 1999! 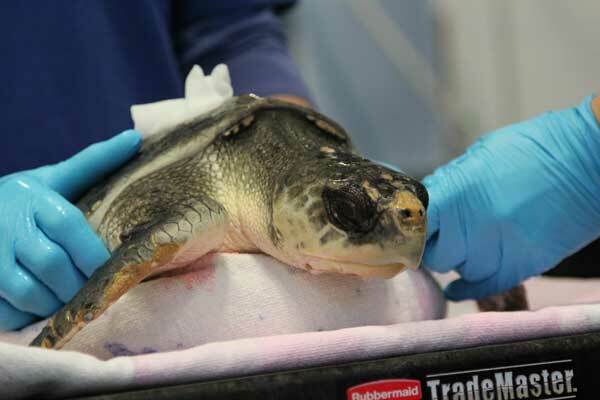 Anyone who finds a sea turtle on the South Shore, whether alive or appearing dead, should call the Aquarium’s Marine Animal Hotline at 617-973-5247 or contact their local animal control officer. 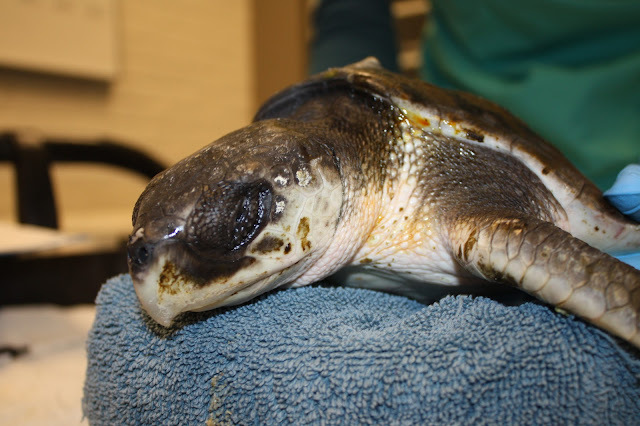 Hypothermic sea turtles continue to wash up in record numbers on Cape Cod. But in an unusual twist, two large loggerhead sea turtles have stranded on South Shore beaches since Monday. Today, Hull animal control officer Casey Fredette retrieved a live loggerhead from Nantasket Beach while on Monday another 40 pounder was rescued in the Humarock section of Scituate. 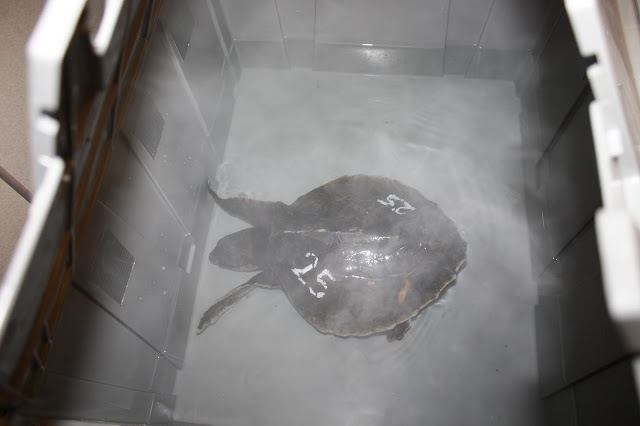 Cold-stunned sea turtles strand annually on Cape Cod but almost always on the southern and eastern beaches of Cape Cod Bay from Sandwich to Truro. Typically, the northwest and northeast winds of late autumn create enough wave activity to drive the floating, nearly immobile marine reptiles ashore on those windward towns. Strandings on the South Shore are very rare events, and normally are confined to the discovery of long dead, smaller turtles early in the winter. Hardy beach walkers on Cape Cod are familiar with the drill of what to do when they encounter stranded sea turtles as they call the Mass Audubon Sanctuary at Wellfleet Bay, which is the sea turtle first responder organization for the Cape. However, for South Shore residents, this is an unusual event. 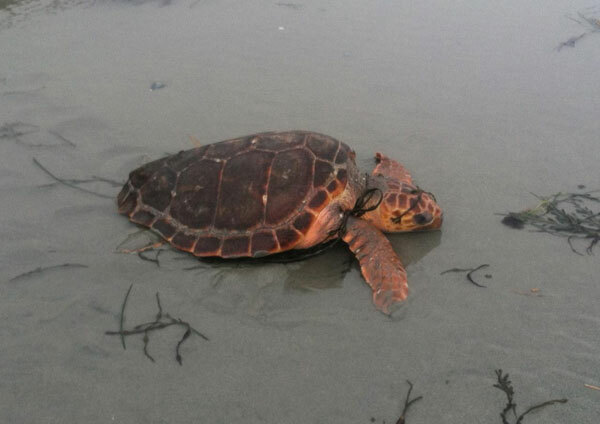 Earlier in the week, well-meaning but misdirected beach walkers tried to return a hypothermic sea turtle to the frigid waters that it was trying to escape. 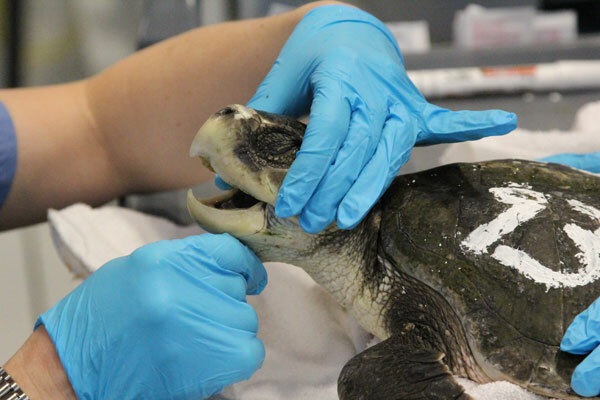 Those finding a sea turtle on the South Shore, whether alive or appearing dead, should call the Aquarium’s Marine Animal Hotline at 617-973-5247 or contact their local animal control officer. 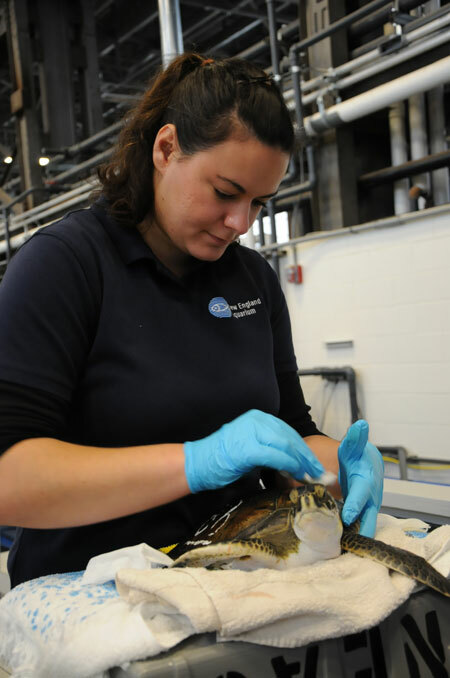 Washed-up sea turtles with body temperatures in the 40’s and with heartbeats as low as one per minute may appear dead but can still be re-warmed and revived at the Aquarium’s off-site animal care center in the Quincy Shipyard. Aquarium officials are puzzled by the unusual stranding locations but are asking for the public’s help in watching for more turtles on South Shore beaches. These two loggerheads were easy to see given their fairly large size and beautiful, chestnut brown shells,. However, most of the turtles that wash up are much smaller at 2 to 12 pounds and black in color, which blends in with other flotsam at the high tide line on a beach. These turtles are Kemp’s ridleys, which are the most endangered sea turtle in the world. 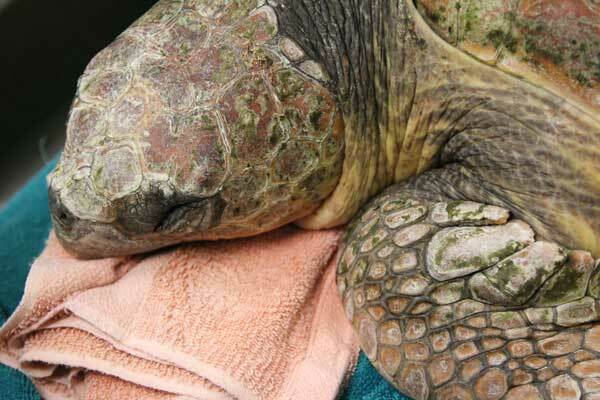 This most strange sea turtle stranding season for many reasons marches on. 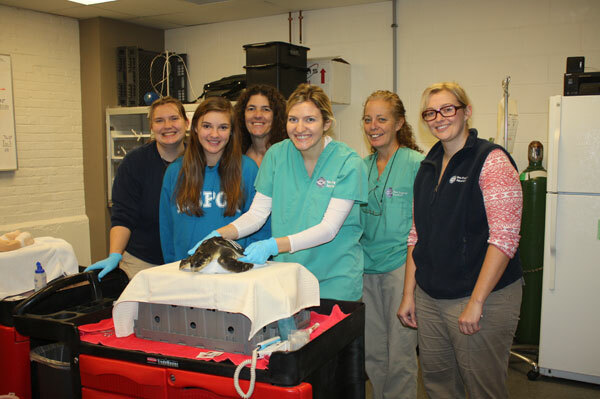 This past Saturday, 13 hypothermic sea turtles were brought to Quincy from Cape Cod. That is an unusually large number for a single day this late in December. Double digit admission dates are not common and normally happen in November. Among the 13 were 9 loggerhead sea turtles. 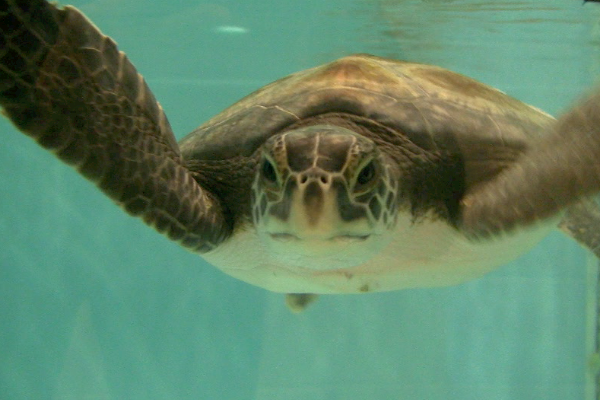 In a typical year, the Aquarium might treat 4 to 6 large loggerheads in its two month long season. The two additional South Shore loggerheads over the past 24 hours brings the total number of stranded loggerheads total to 45! 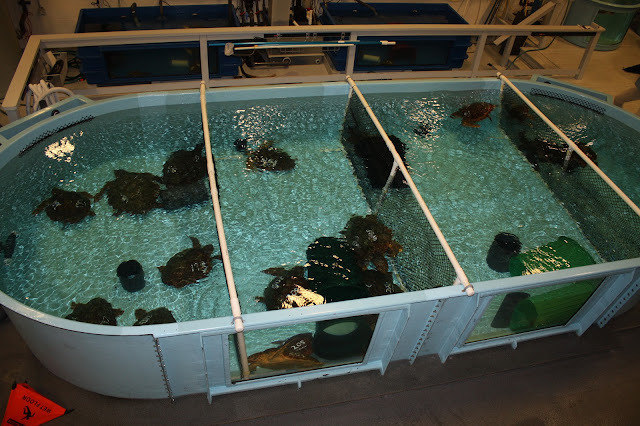 The 40 to 100 pound loggerheads create a strain on available tank space at the Aquarium’s new sea turtle hospital which has a capacity of about 100 sea turtles. 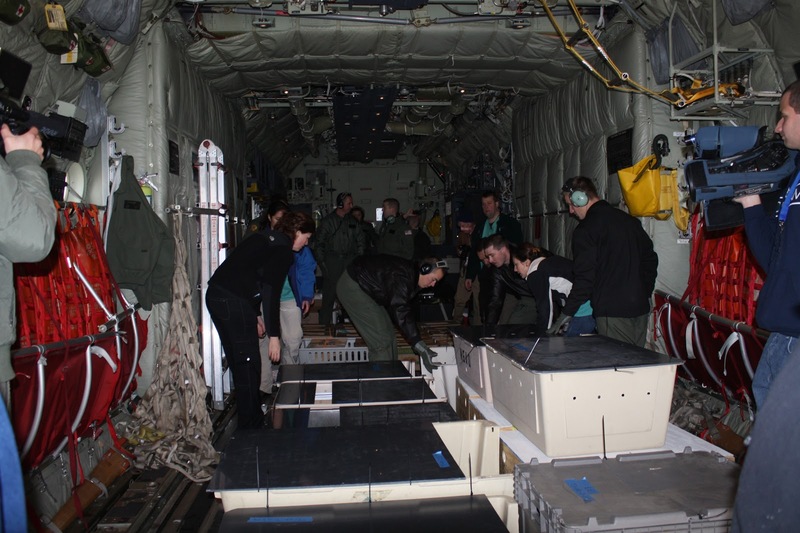 74 re-warmed and stabilized sea turtles have been transported to other marine animal rescue facilities up and down the East Coast, including 35 sea turtles that were flown from Cape Cod to Florida aboard a Coast Guard plane earlier this month. 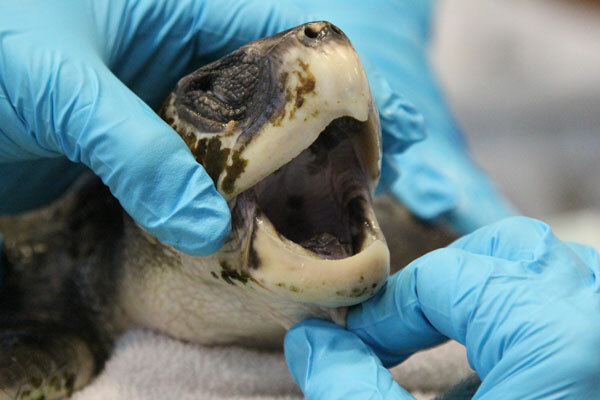 To help with the overwhelming clinical demand of caring for so many sea turtles, biologists from the Virginia Aquarium, the National Aquarium in Baltimore, the Riverhead Foundation on Long Island and IFAW on Cape Cod have been brought in to assist. The Aquarium welcomes financial donations to help offset the cost of such an unexpected record event. Over the past twenty years, the Aquarium in partnership with Mass Audubon has rescued, rehabbed and released over 1000 endangered sea turtles. 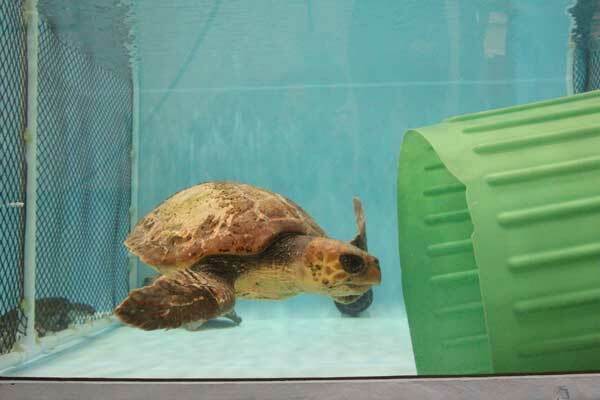 Go inside the Aquarium's Animal Care Center to learn more about these unique loggerhead strandings on the South Shore with WBZ Channel 4. Photos from Turtle Rescue Season: Towels for Turtles! The Rescue Team will be posting details about the transports and treatments at the Animal Care Center in the days and weeks ahead. In the meantime, we'll be sharing pictures and video of the activity at the sea turtle hospital so you can have a feel for the action during this incredibly busy year—150 live turtles treated so far, and still counting! Sometimes it's the little things that can make a huge difference—like fresh towels. That's right, plain old terry cloth bath towels! 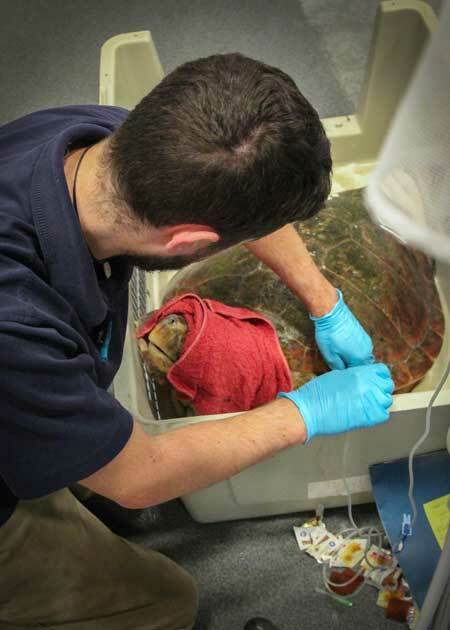 When we're treating turtles, we go through a lot of towels. Notice the two towels used during this exam. As soon as one gets soiled, which is often, we switch it out for a new one. We use the towels to cover our exam tables. We use them make the turtles comfy during check-ups. 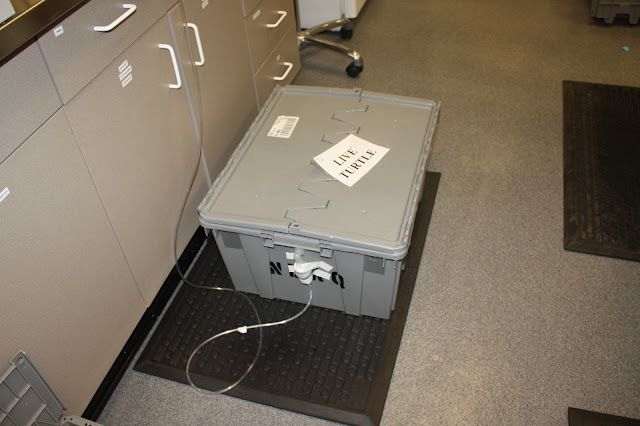 We use them to pad transport boxes when the turtles are shipped to other facilities. And we use them to dry our hands, which are constantly dipping in and out of pool where the turtles are exercising. Laundry can add up. We fill two to three barrels a day with dirty towels. Our friends at the MSPCA quietly and profoundly made our lives easier one day when they stopped by with a batch of fresh towels. 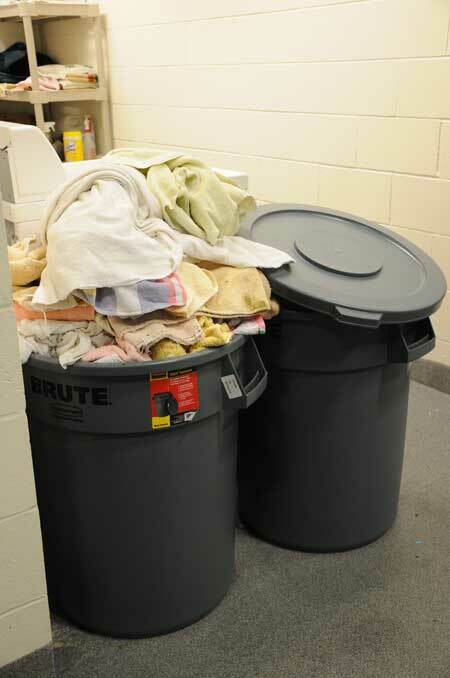 Not only that, they lugged the piles of dirty laundry we'd accumulated off-site to wash. 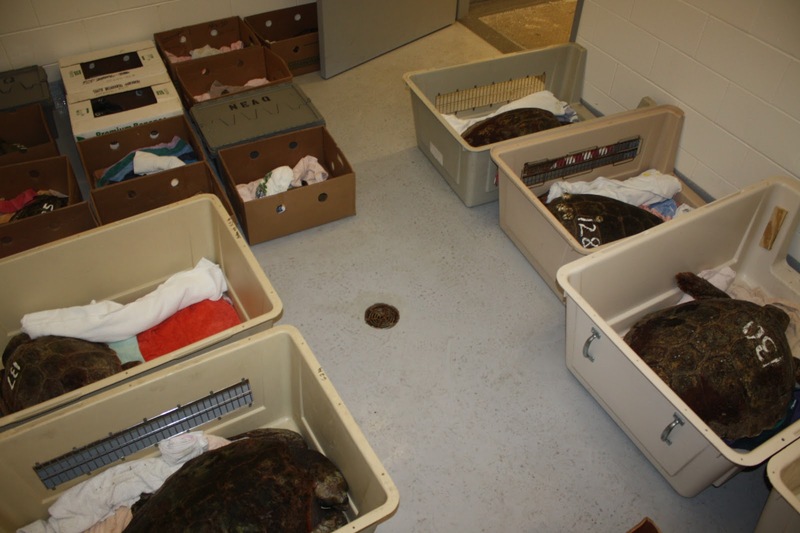 They returned the next day with the clean towels ready to help during turtle exams. 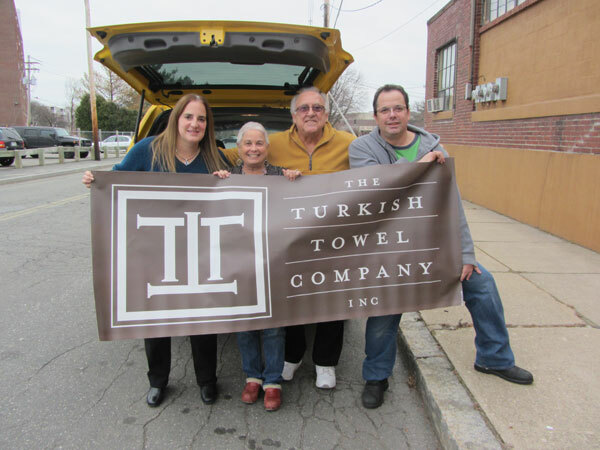 Deb from the MSPCA also worked with friends at the Turkish Towel Company to donate a car-load of new towels to the Animal Care Center. Angela, Audrey, Frank and Matt from The Turkish Towel Company packed a car-load of fresh towels that were donated to the Animal Care Center. Thank you! And thanks to everyone who has supported us during this busy stretch—through your time, through donations, through encouragement on the blogs and Aquarium social media and much much more. One the most crucial—and time consuming—parts of the day at the turtle hospital is doing physical exams and health checks on the turtles. 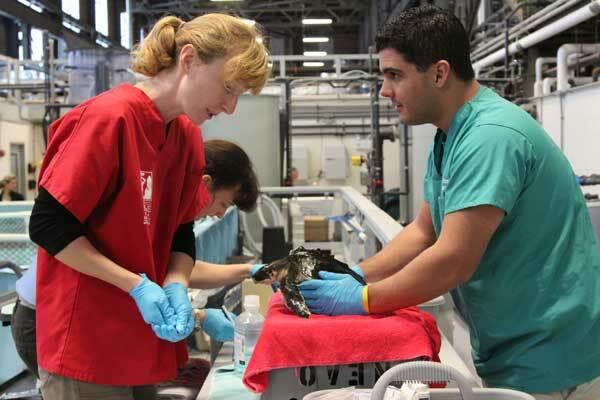 Rescue staff and veterinarians at the Aquarium spend hours drawing blood, examining each animal, treating injuries and studying individual blood results to determine the best possible treatment for each animal. When an animal is transported to another facility, they travel with a detailed medical chart that explains their treatment/medical plan. Turtle exams take at least two people: one person (often a volunteer) to hold the animal while it sometimes energetically flaps its flippers, and a staff biologist to draw blood, administer medication, treat wounds/injuries and all other parts of the exam. Part of the exam entails a visual inspection of the turtle, including its plastron (or bottom of its shell). 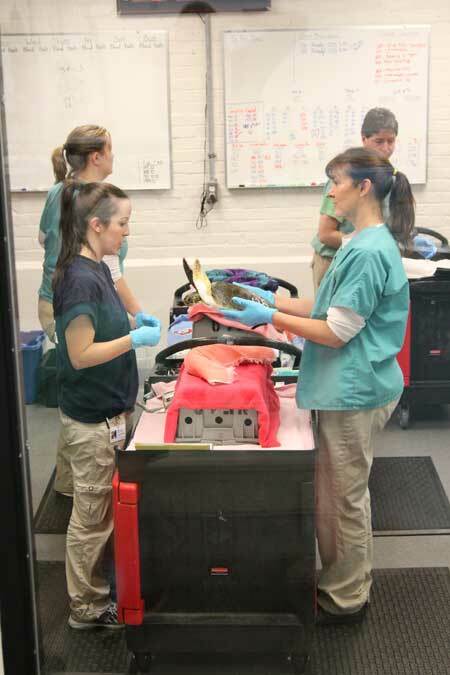 During turtle exams, you'll usually spot a rolled up towel propping up the little patient. The rescuers call this a donut. It helps facilitate breathing by allowing the lower shell to easily expand during breaths. What medical exam would be complete without a look inside the patient's mouth? Rescuers make sure the mouth and throat look normal, without any infections or obstructions. Many thanks to the people and institutions helping out during this extremely busy stretch! From our partners at the Mass Audubon Sanctuary at Wellfleet Bay walking beaches to rescue scores of turtles to volunteers feeding turtles to donors helping to shuttle turtles to distant rehabilitation facilities, there are a lot of people to thank. And there are lots and lots of turtles to introduce. Stay tuned. As we've mentioned here and here, this has been a remarkable turtle rescue season not only because of the numbers of turtles but because we're getting a lot of larger turtles that need care. Where our Kemp's ridley sea turtles might weigh in at about 3-6 pounds, some of the loggerhead sea turtles tip the scales at 50 to 100 pounds. 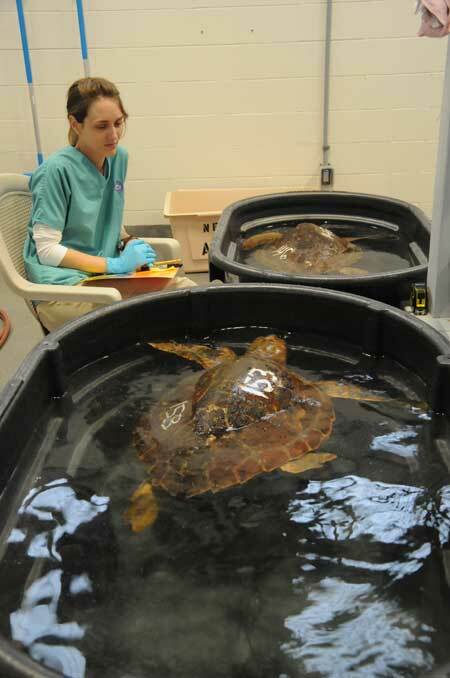 Here's a look at some of the loggerhead sea turtles during their treatment at the Aquarium's Animal Care Center. 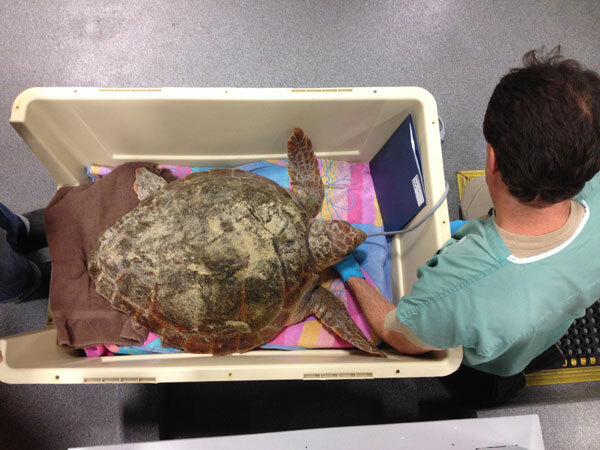 A loggerhead awaits treatment. Note the wide, blocky and reddish color of its head. That's one way to tell it's a loggerhead. Aquarium biologist Eric Payne delivers IV fluids. 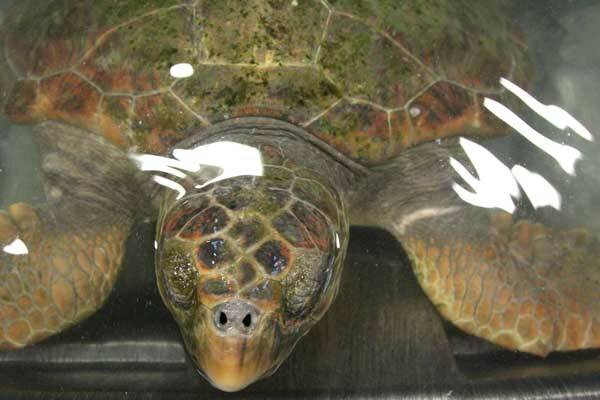 The towel on its head helps reduce the turtle's stress level during the treatment. 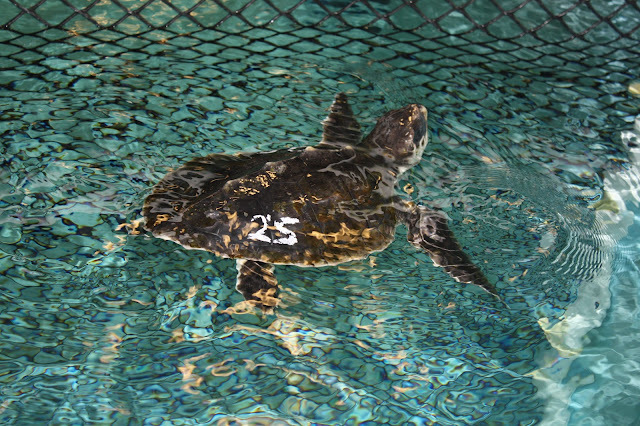 The loggerheads are too big for the kiddie pools that are used to exercise the Kemp's ridley sea turtles. The big guys are hefted into larger tubs for their initial test swim. 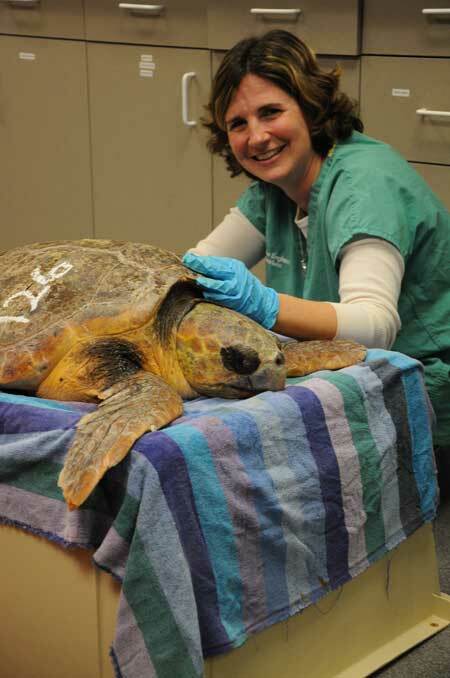 A loggerhead sea turtle is prepared for a treatment by former Aquarium Rescue staff member, Belinda Rubinstein. Of course, none of these turtles are as big as Myrtle at the Aquarium, or the leatherback sea turtle that was rescued earlier this fall (by the way—he is doing great out in the big blue, map to follow after this event). But these loggerheads are big and strong...and amazing. We're happy to able to treat these endangered animals with the help of our rescue partners and volunteers. Loyal readers of the Rescue Team blog may have noticed that the team is not posting blogs as frequently as they usually do. This season they've had more than 150 turtles come through their doors, so they're pretty busy. This guest post was written by Ann Cortissoz, a member of the Marketing and Communications department who is volunteering in Quincy. The Marine Animal Rescue Team staff and volunteers are pros at taking care of large numbers of cold-stunned, stranded turtles. But this season, with more than 150 turtles, the Rescue Team had to send out a call for help. Many of us who work on Central Wharf have been making the trek down to Quincy to lend a hand, and many of the Team's colleagues from other rescue organizations are helping out as well. 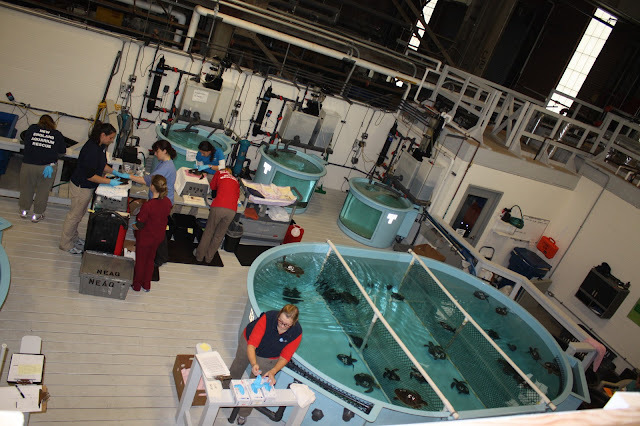 The busy treatment room at the Aquarium's turtle hospital in Quincy. Left: Susan Thompson, from the Aquarium's Development department, feeding the turtles. 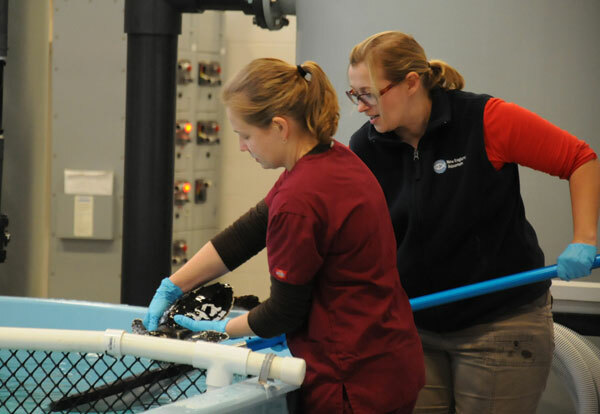 Right: Jane Hoppe, from the International Fund for Animal Welfare, holds a rescued turtle while Erin Weber, from the Aquarium's Marine Mammals department, gives it an injection. Bess Edwards, with the Aquarium's Conservation department, holds a green sea turtle during exams. 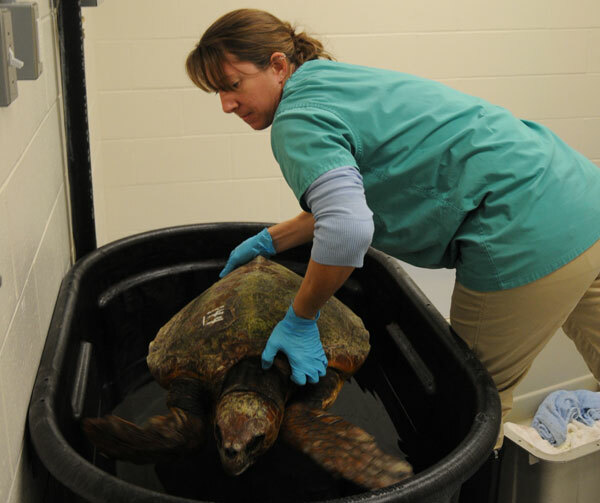 Laura Dill, from the Aquarium's Development department, helps net a patient for a treatment. Sarah (foreground), from the National Aquarium in Baltimore, and Julika (background), a biologist from the Riverhead Foundation for Marine Research and Preservation, help conduct turtle exams. It has been a record setting turtle season with BIG numbers of cold-stunned sea turtles being admitted to the Animal Care Center. As of this moment, we have had over 160 turtles come through our door in the past month. We haven't had much time to share stories about our amazing patients, but I just wanted to take the time to show you the BIG events happening for the Rescue Team through some photos from the front line. There is a flurry of activity happening in the turtle hospital. As you can see above, we have BIG numbers of volunteers and time being spent on the animals. Extra treatment stations are being set up on the deck, staff from other departments in the aquarium as well as other organizations (including Riverhead Foundation in NY) are being called in to help, hours and hours of feeding and swimming turtles in kiddie pools are happening on these long days. The clinic is busy with blood draws and intense treatments. Just take a look at our blood and radiograph board from last week! And this doesn't even include the regular exams and treatments taking place. It's a BIG job getting these turtles healthy again! We're also getting large numbers of some BIG turtles this year. The loggerhead sea turtles we are seeing range from 20 pounds to over 70 pounds. We are also getting several in one day. The photo above shows a group of 22 turtles that all arrived last Thursday which included 6 of these big guys. Normally we may see 1-5 loggerheads in a season, but we have received over 25 already! 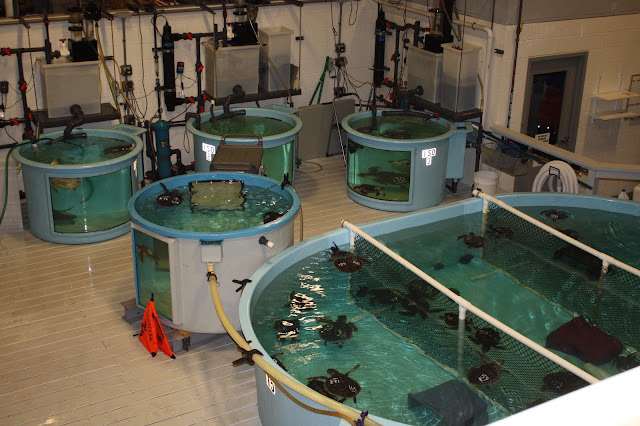 With these large numbers of turtles coming in, our tanks are getting crowded. I love the picture above of our green sea turtles getting some rest huddled to one side of the tank (away from the outflow). 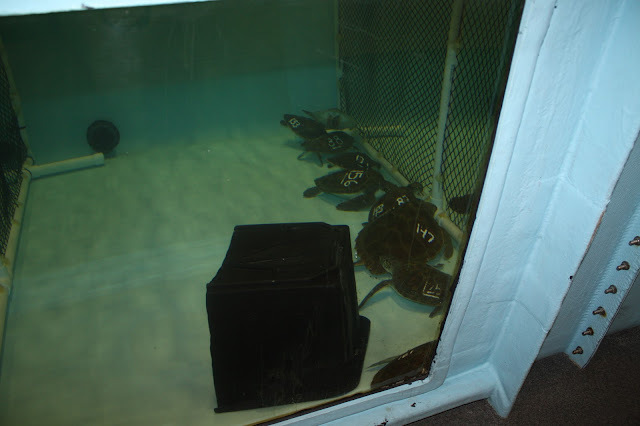 We have begun transporting small numbers of turtles to several other facilities, including the University of New England (UNE), National Marine Life Center, National Aquarium in Baltimore, Virginia Aquarium, South Carolina Aquarium, and the Georgia Sea Turtle Center. The BIGGEST transport of all happened on Friday! 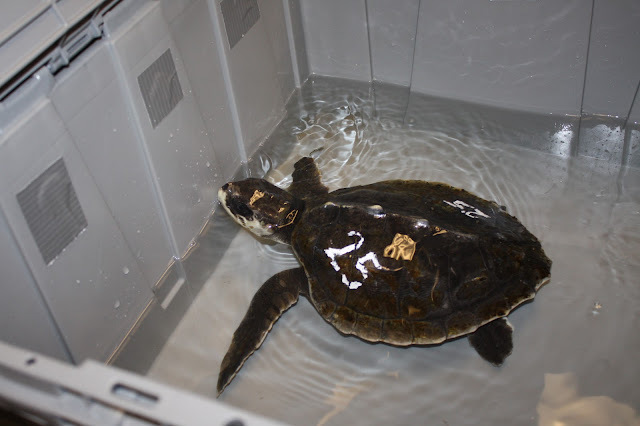 35 sea turtles - 15 loggerheads (including six that had been sent to UNE) and 20 Kemp's ridley sea turtles - were flown to Florida to continue rehabilitation at various facilites. 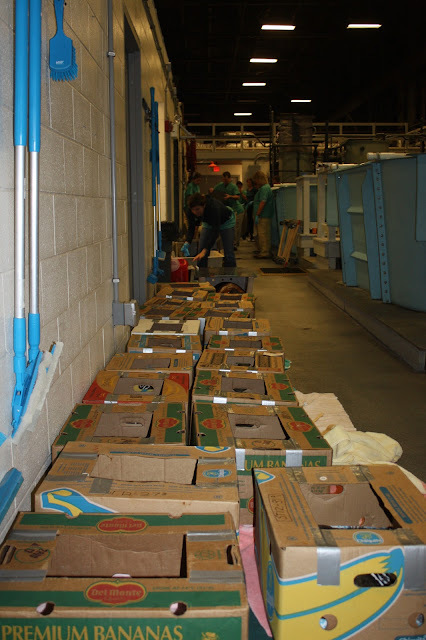 At 4:30am several volunteers and staff met in Quincy to prepare the turtles for transport. Just look at all these boxes! The turtles were loaded into a trailer (courtesy of IFAW's Marine Mammal Rescue Team) and transported to Otis Air Force Base where they were loaded onto a C-130. The Coast Guard did us an amazing favor by flying these animals to Florida. Above, the turtles are done being loaded and they prepare for take off. We appreciate the BIG support from all of the organizations helping us for this transport. UNE and IFAW went out of their way to provide the transportation to the air field and we could not have transported such a large number of turtles without the Coast Guard's kindness. And a huge thanks to the facilities who received these patients and will continue their care, including SeaWorld Orlando, Mote Marine Laboratory, Florida Aquarium, Loggerhead MarineLife Center, and Volusia Marine Science Center. The aquarium will continue to update you on the BIG happenings in Quincy, and on behalf of the rescue staff, we will try to get some more photos and stories to you in the coming weeks. Our amazing volunteers are tirelessly working alongside us, and we all appreciate the support as the BIGGEST turtle season in Massachusetts continues.